We as a collective have not figured out how to integrate our male and female energies. They are in conflict. It's time to build cooperation between our male and female counterparts within ourselves and to integrate the whole being. Feminine Energy carries feelings. Feeling is emotion. Showing emotion has been so frowned upon since our very births in both genders that we have collectively become detached from our emotions. Both genders are inclined to disregard their emotions and do what they're told or what is expected even when it doesn't feel good to do. Both genders at this time are yearning for emotional freedom. It is time to start feeling and to honor those feelings. Stop violating the way you feel. If something doesn't feel good, don't do it! Your feelings are your inner guidance system here to assist you navigate life. Suffering is not honorable. It's not a badge of courage. It's not the right thing to do. Masculine and Feminine energies work in tandem with each other. Both men and women have created hard shells around their energies to protect themselves. Feeling, requires calling upon the masculine energies of bravery and courage. Developing true emotional strength will shatter them. It takes courage to feel negative emotions. It takes courage to express how you feel. It takes courage to leave a stable job that makes you miserable. It takes courage to leave a relationship that no longer serves you. It takes courage to cut off toxic people in your life that you may share blood with. Masculine and Feminine energy are designed to compliment each other. Many women adopted masculine energy in order to be seen as strong and capable but often times at the expense of their feminine energy all together. This is because we haven't had any examples of what an empowered woman who's character hasn't been dragged through the mud looks like. Men have cut off their feminine energy because we haven't had any example of a vulnerable male who's masculinity hasn't been questioned or ridiculed. Integrating is about finding out what it's like to be a strong female or a vulnerable male without sacrificing the other side of you. This is new territory, but the shift is in progress. We're creating a new paradigm. Integration ignites the twin flame. The twin flame is the male and female existing in one body. 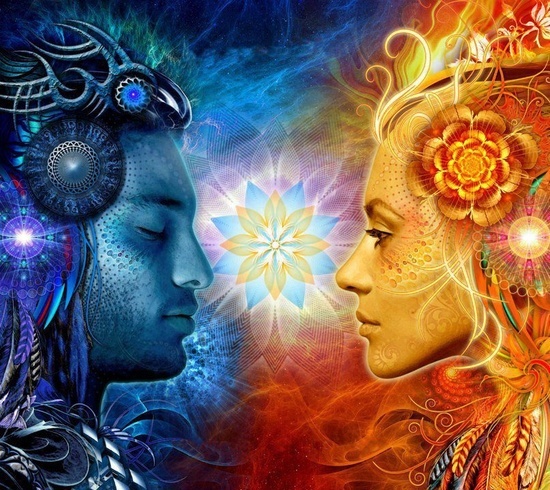 After you have integrated the male and female energies within yourself you activate your own twin flame. Now when seeking a partner you will not seek someone to fill the need that you have not acknowledged or have not filled yourself. You will seek someone that is also complete.